First, Matt Wilkinson’s round two heat one loss to Brett Simpson, where he came up short by just 0.24 of a point. Then Julian Wilson’s loss to rookie Alex Ribiero, where he lost by a minuscule .05! If you’d like to weigh in on the others hit up the WSL heat analyser here. Wow this is just plain fucked up. As bad as I want jj to win the world title, I still think this was the worst call I’ve seen in surfing!!!! If tanners wave was an 8.67 please tell me how @gabrielmedina was an 8.30?!?!?! @wsl come on guys!!! Not cool!!! Such a blatant rip off !!!! And anyone found in violation could face ‘Monetary Fines and Disqualification.’ and ‘Suspension and Expulsion.’ Ouch. 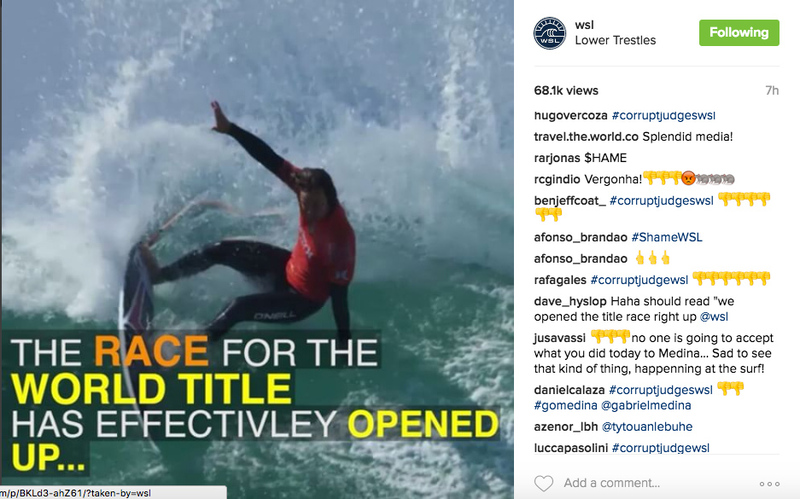 We wait with baited breath to see if the WSL throws the book at the boys for venting on insty! Since we doubt your a WSL competitor, why not throw your opinion into the hat in the comments below. Do you think the heats should be re-surfed? the judges fired? or the entire scoring system overhauled? !